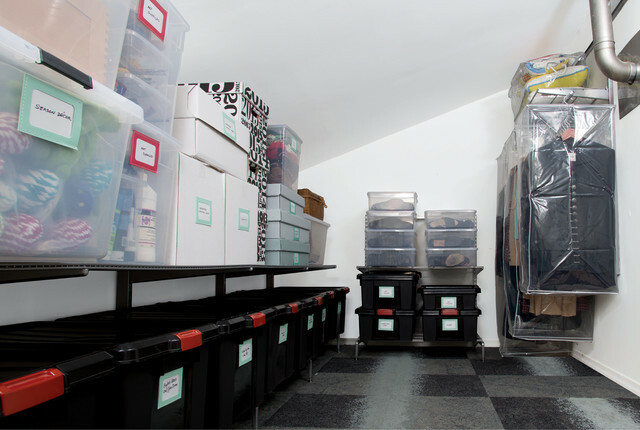 Slip our Stor-Pod Shelf Enclosure over one of our 18" x 48" x 74-1/2" InterMetro Shelving solutions to create a fully enclosed storage area in your garage, basement or attic. Items stored on the shelves are protected from dust, bugs and moisture, thanks to the innovative material that allows ventilation and prevents mildew. The zipper door rolls up and ties back for easy access to items inside. Keep your bike safely stored with our Bike Hanger. Constructed of solid steel with a black epoxy finish, it's weather-resistant, cushion-coated and can support up to 30 pounds. Remember to keep placement of this item in mind as you plan your garage through our Plan a Space design tool. Stor-Pod Shelf Enclosure is rated 3.1 out of 5 by 37. Rated 1 out of 5 by LWinIN from Disintegrates and falls apart into little pieces!! I purchased two of these to keep things from getting dusty in the garage. They are both disintegrating and falling apart into little pieces. Such a waste of money!!! Rated 4 out of 5 by jrogern from Very Attractive When Installed I read the other reviews before I purchased this cover and was not so much bothered by it disintegrating in a year or two, I wanted more of a temporary cover. The cover is very attractive over the shelf. It may not be as functional or practical, as you have to unzip it every time you want something from the shelf (I am using mine as overflow space for my All-Clad pots and pans, and various kitchen equipment like blenders, etc.). The cover does not fit the shelf if you have the heavy wheels. Considering I am not that worried about bugs, I cut the bottom off and it works perfectly for me. We are only renting for a year, so the cover will most likely not be needed in the future, but for now it is nice. Rated 1 out of 5 by Masonlcmason from Falls apart Bought 2 of these in February 2017 didn't take them out of the package for a couple months after received due to moving. Got them put up, saw the upper corner looked like it had a while in it went over to look at it and touched it and the fabric fell apart in my hands and all over the ground. Wish I would have looked at the comments before I bought two of these that only lasted maybe a couple months at most. Waste of money. Although the plastic is probably the only part that didn't fall apart. Figured for the oricr point would have lasted much longer than a couple months. Very disappointed. Rated 1 out of 5 by rbos from Disintegrates The enclosure looks nice and protected contents from dust. However after about a year the thin fabric becomes brittle and breaks apart into pieces with normal use. Rated 1 out of 5 by LovesABargain from Starts out great, but eventually disintegrates This fit wonderfully over the shelving unit we also bought from The Container Store and at first it worked perfectly in our garage keeping everything stored inside clean and easy to find. Even though it was always handled with care it started to disintegrate and is now covered with tape that is holding it together and keeping dust out. Very disappointed in the lack of quality in this cover and I definitely would NOT recommend it. Rated 1 out of 5 by Xandralisa from Don't buy this it will disintegrate They don't sell the durable version that they used to have for this. The attached photo shows what happened to ours on an enclosed porch. That destruction is not from animals, it fell apart on it's own. And I can't buy a more durable replacement, I don't know what to do. Rated 1 out of 5 by Munchmom from Fell Apart Within a Year We have 3 metro storage shelves in our garage and purchased covers for each to keep our stored items clean and dust free. Despite always using the zipper and carefully handling the covers, all 3 started to fall apart within about a year of installation. I would love to find a cover that would hold up for several years, but unfortunately this isn't the one. I would strongly advise against purchasing. Rated 1 out of 5 by jchow75 from Fabric disintegrates Maybe it's our climate but with our stor-pod cover being kept in our So Cal garage for the last 3-4 years, the fabric started ripping and disintegrating. Now it's in tatters and any slight touch makes it give way to a fine powder. Worst of it is that it clings to the floor and doesn't sweep away easily at all. Rated 1 out of 5 by winkz40 from Fell apart after a couple of years. We purchased two Metro Shelving units for our garage to store Christmas and camping items. The product worked great for 2 years, especially for someone with dust allergies, but then it fell apart, seemingly from out of the blue. I went to get an item from the unit and when I went to zip it up again, the fabric completely tore away from the zipper. I tried to duct tape, but it didn't work. Just this weekend, I went to grab some beach towels and when I went to secure the strap to the velcro up top... it made another hole. Disappointed, as the material is literally falling apart. Buyer beware! This product will not last. Rated 2 out of 5 by CAinSD from OK but then falls apart Initially this was a good buy. I purchased it to cover all the kitchen tools/equipment we have so they didn't get all dusty. It worked great but after a few years the fabric cover started to deteriorate and become brittle. Now it easily tears. I don't understand why they don't use a stronger material, maybe vinyl especially for the price. Rated 5 out of 5 by Jrog from Great addition to Metro Shelving units!! I have several Metro shelving units, and I think they are the best storage in the world. Despite that fact, they are still subject to dust, the same as any type of shelf. The dust doesn't affect the shelf unit quite so much as what you place on it, so the Stor-Pod keeps the dust off whatever you store. They are pricey, but they hold up well and they are pretty easy to install. I have wheels on my units so I can move them around, and was delighted to see that the Stor-Pod has purposed holes in the reinforced corners to allow the wheels to be used! Highly recommended! Rated 1 out of 5 by cjsunrise38 from Broken Zipper Like many other reviewers we were excited about this cover to protect our kids cloths in our wet basement. After one zip the zipper broke. I was able to half fix it and only went to the shelf unit when I absolutely needed to but after a year of limited use the back cloth has ripped and the zipper just fell off. I'm so disappointed for the price you would hope it would last. I also wanted to add I bought one of these covers 5 years ago and the quality is so much better then what is currently for sale I'm so sad. Rated 1 out of 5 by NeatFreak71 from Zipper is rubbish The zipper came off this item the FIRST time I attempted to zip it up. Had planned to use on several shelves, and open when items in use, close up when not. Had all winter clothing items in one, went to zip up in spring to store and the zipper came right off and is impossible to fix. So annoying! Rated 3 out of 5 by Ladybroad from Excellent function - caution! The Stor-Pod shelf Enclosures are functionally outstanding. The CAUTION: The material is sensitive to heat . I slipped on the protectors over the shelving they are designed to fit. The shelves are in a warm/hot garage in the South and after two years, the cloth part of the enclosures deteriated to the point, I had to replace them. I recently purchased two more to replace the first set. I would not recommend the enclosures in a warm/hot location. Rated 2 out of 5 by Unicorn from Shelf enclosure torn due to sun and rain I bought this in February and put it in the balcony. However, the enclosure is made of a not-so-strong fabric and in June, it started to get torn at certain points. I guess it is because of too much exposure to sun and the fabric has weakened. Although it is a good shelving solution. think twice if you want to put it outdoors and under the sun. Rated 5 out of 5 by Cimmy from First and hopefully last shelf enclosure for us So far so good! The cover seems to be doing its job in the present Houston TX eighty-degree weather. Look forward to seeing how it withstands the effects of life and that comes with it in the expected prolonged hundred-plus degree weather in our true summertime. Rated 5 out of 5 by whitingww from great product have bought 4 of these to use in my garage. Keep everything clean, dust free & hopefully bug free. I park my car in the garage so it also keeps everything free from gas fumes. Rated 5 out of 5 by Rackinishu from Excellent Storage Great for general storage, especially in damp areas / basements. I personally use mine as an enclosure to grow edible fungi. Sealed grow pods are stored inside and the Stor-Pod helps protect my projects by keeping pasts / bugs out, and still allows fresh air exchange. Rated 5 out of 5 by havefun from great storage option Using the Stor-Pod enclosures to keep my Christmas collectables free of dust and safely stored has been great. I could see using these for so many other storage options. Rated 5 out of 5 by BlueSky2014 from Very Satisfied We bought this enclosure to store our kitchen items/Serving Dishes in the garage. This was the perfect solution for our need. It was easy to enclose our current shelving unit and we are able to store so many items on it. Going vertical for storage solutions rocks! Rated 5 out of 5 by Butterlady from Easy to use. I bought this to use with the metro storage unit. It was easy to put on and it's great to be able to see everything the Metro shelves. Rated 4 out of 5 by StephV from Keeps it clean So I guess the question is what are you wanting from this. It keeps the dust and bugs out and the plastic is easy to see through and study, the fabric and zippers and not very heavy duty though. For example, I was fixing something inside the closet (while assembling) and made one or two small tears with very little effort and lost a zipper. Now that it is in place we just can't be too rough with it. But the gray part is more gauze fabric and less canvas. Rated 5 out of 5 by AuroraSky from Great protective cover We've had to put up temporary shelving in our basement rec room. It's prone to becoming dusty since we keep pet birds, and these covers are great. They were very easy to install and look attractive. I absolutely recommend them. Rated 4 out of 5 by Pawwas from Great idea Works great keeping dust off, a little thin for the material. Only one I could find with bottom. Rated 5 out of 5 by snoopy1 from Keeps items clean in the garage I love it.......bought it to fit a 5 tier shelving unit and fits like a glove. I feel better about putting good quality items out in the garage. Rated 4 out of 5 by Yankee from Good Purchase I'm very happy with the purpose this product serves. It is very difficult to find complete enclosures for storage shelves. Rated 5 out of 5 by hpotterycats from Great Product! Love the Stor-Pod! One downside was the fact that I wanted to use castors on my shelves. Simple solution..I installed 3/8" brass grommets in the bottom corners. Shelves are now nicely covered and I can move them around my garage. Rated 5 out of 5 by purplespooncatering from Best Purchase I have purchased a few items from the container store, but this is the best yet. I have a catering company and share kitchen space, so I am able to securely store my dry goods and party supplies on a baker's rack. This cover is like having a built in cabinet, what a convenient and organized way to keep things. I ordered online and was able to pick up my item in Paramus, NJ with ease. The customer service there was excellent. Rated 5 out of 5 by willijen from Great storage I bought the InterMetro shelving and put in the clothing bar. Then added the Stor-Pod enclosure so that bugs can't get in. This worked perfectly for storing my off season clothing. Is this the all vinyl or fabric version? I bought a couple of these a couple years ago and the entire enclosure was a sturdy beige vinyl. Then I bought a gray version and it's a flimsy paper-like fabric that has torn in many places after only a year. Could you please confirm which this item is? It has both. The fabric is the portion that rots. I need something that I don't have to worry about opening and finding spiders in or, other insects but...phobia of spiders is out of control so I have nothing, storage wise, in my garage as of yet and lived here nearly a year. Also, I end up spraying mass amounts of spider/insect spray in garage and want to be sure contents are protected from spray and just getting wet in general. If spray or spiders get inside then it, and all contents, will have to be throw away. I'm that bad...actually, that doesn't even scratch the surface of my debilitating and life controlling fear. I would like some type of storage cabinet w/ shelves but must be completely sealed when cabinet doors or such are closed. If this item isn't what I'm looking for, and there is something a available that fits the above criteria...PLEASE, any and all suggestions and/or info on such item is GTEATLY APPRECIATED!!! Insects could penetrate thin material on side. Mine deteriorated within about a year. So I&rsquo;d say, &ldquo;No&rdquo;. Will this work if you have casters on the unit? Hi! I had the same question myself. All my shelving units are on wheels and I would not have it any other way! The Stor Pods have openings in the reinforced corners sewn into the bottom of the cover, so the shelf unit legs drop right through. You can then reinsert the castors as you would normally. The only pain is you really need to unload the whole unit in order to install the Stor Pod. Hope this answer helps! will this hold a fair amount of bed comforters? I need extra storage in a bedroom that contain so many comforter sets. I need plenty of shelving to get them off the floor. HI! I have several metro shelving units and they hold a lot! YOU can decide how many shelves you put in a unit and then the Stor Pod surrounds it all. As long as you fold your comforters so that they are no bulkier than the Stor Pod is deep, you should have no trouble storing quite a few! Hope this helps!